Ludwig Hirschfeld-Mack was born at Frankfurt-am-Main, Germany and arrived in Australia in September 1940 on board the Dunera, an internment ship with over 2,000 Italian and German deportees sent from England. The majority of the men on the ship were interned for up to two years in prison camps at Hay, then Orange in NSW and Tatura in Victoria. Hirschfeld-Mack studied in Munich at the Wilhelm Debschitz school and art history at the University with Heinrich Wölfflin and Dr Burger. His studies were broken by his service in the First World War. Following the war he went to the Stuttgart Academy, and then was one of the first students to enrol at the newly established Weimar Bauhaus in 1919. He attended classes in the Printing Workshop under Lyonel Feininger and Carl Zaubitzer. He collaborated on a number of projects, including print portfolios, and made lithographs. While at the Bauhaus he experimented with colour theory, which he had first encountered while studying in Stuttgart with Adolph Hölzel at the Staatliche Akademie der Bildenden Künst, and made a series of 'Reflecting light compositions' that involved the projection of lights to form abstract compositions, accompanied by music. He left the Bauhaus in 1925. In 1936 he emigrated to England as he found it increasingly difficult to find work under the Nazi regime, but was interned in London in 1940 and sent to Australia. He spent nine months at Hay from September 1940 to May 1941, before being moved to Orange, then Tatura at the end of 1941; he was released in March 1942 to become art master at Geelong Grammar School, until his retirement in 1957. While interned he made monotypes, watercolours and drawings based on his training at the Bauhaus, and he taught colour theory to other internees at Orange. It is likely that he introduced monotype techniques to others at Hay, based on the 'Dürchdruckzeichnung' method he developed with Paul Klee in 1921. 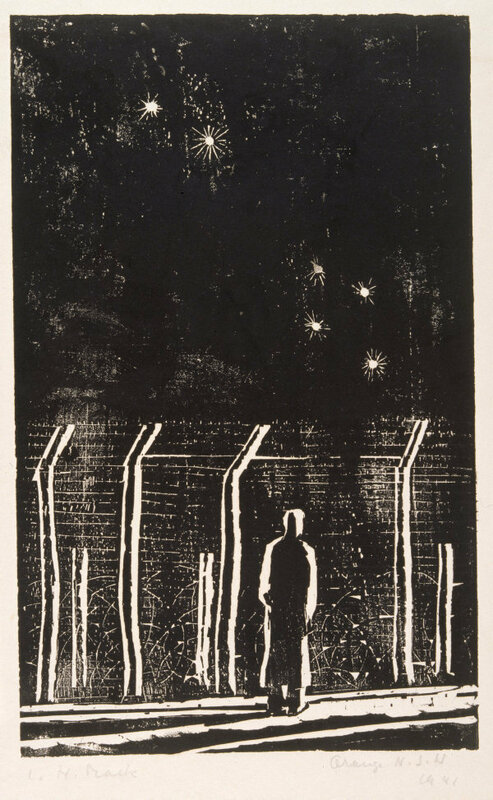 He made a number of woodblock prints while at the camps, several of which are in the Gallery's collection, including a print closely related to this one, 'Merry Christmas' 1941, which was made as a Christmas card. A hand-coloured proof of 'Desolation, internment camp' is in the National Gallery of Australia. Signed l.l. below blockmark, pencil "L. H. Mack". Dated l.r. below blockmark, pencil ".../ 1941".